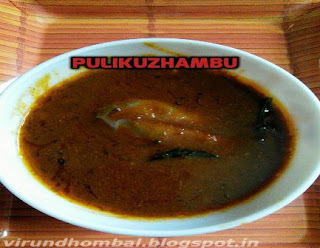 If you have so much mint leaves that you couldn't use up, then try this tasty mint pulikuzhambu and you will definitely enjoy the taste. 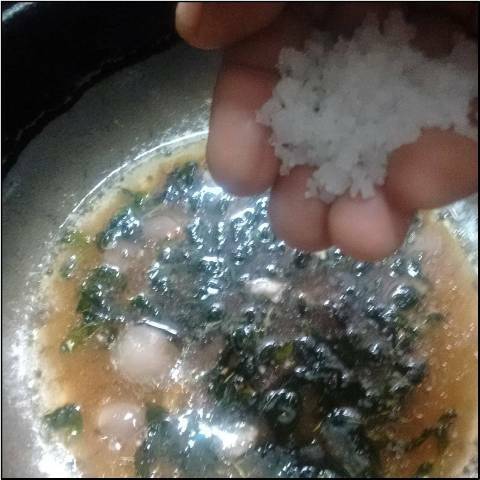 I learned this recipe from a TV cookery show during my college days. This dish takes only 20 minutes from start to finish and it gives you a healthy dish. 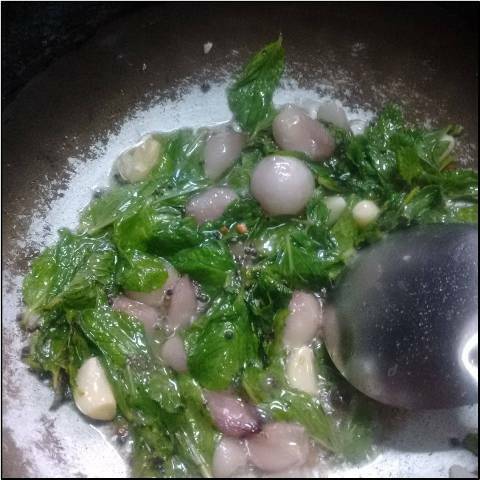 The kuzhambu flavor comes from browning the mint leaves, small onions and garlics well in medium flame. If you saute them in high flame it gets lots of burnt bits which are not so nice. 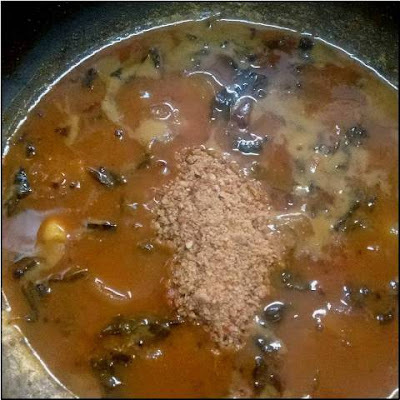 Varying the amount of sambar powder can make your kuzhambu to thick or thin consistency. 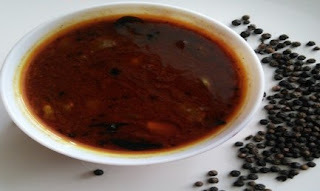 You can also replace sambar powder with red chilly powder or vathakuzhambu powder. The addition of roasted sesame seeds, urid dal powder gives a nutty flavour to the kuzhambu.This kuzhambu is meant to be enjoyed with warm rice. 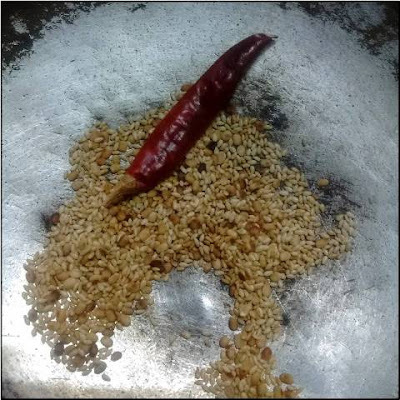 I also like to serve this kuzhambu with simple potato fry and some papads. 1. Soak the tamarind in hot water and extract the juice with 1/2 cup of water. Peel the onions and garlics. Wash the mint leaves well and pat dry them. Heat a pan and dry roast urid dal, white sesame seeds and red chilly. When it cools powder them coarsely. 2. 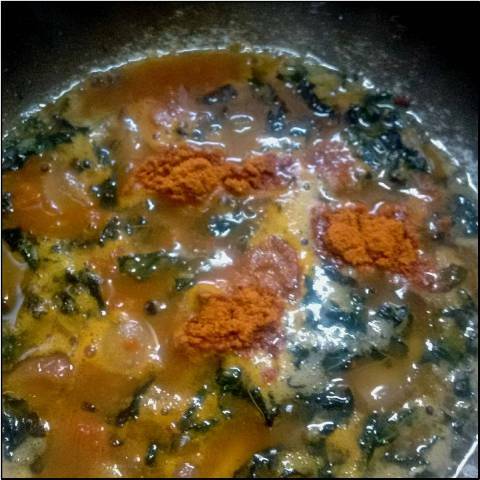 Heat sesame oil in a kadai and add fenugreek, mustard and urid dal. Allow them to crackle and add the small onions and garlic. Saute it till it turns light golden brown. Then add the mint leaves. 3. Saute it till the mint leaves turn dark green in colour and reduces in volume. 4. Then add the tamarind juice and required salt. Mix them well. 5. Next, add the turmeric powder and sambar powder. 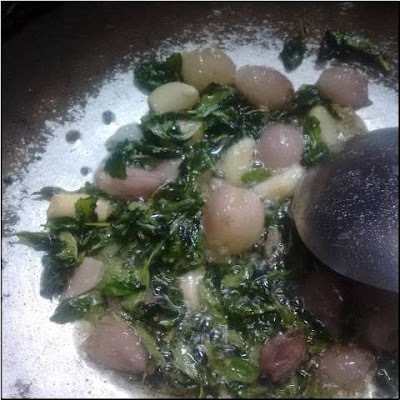 Keep in medium flame and boil until it gets medium thick consistency. 6. When it gets thick add the powdered jaggery and the roasted powder. After adding these ingredients keep it for a gentle boil and transfer it to the serving vessel. 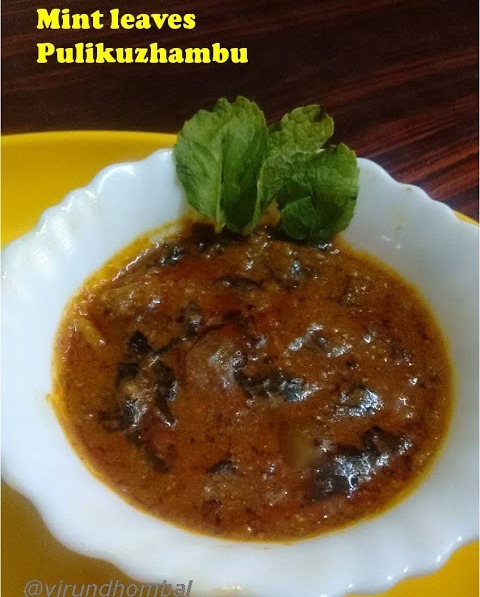 If you try this recipe for Mint leaves Pulikuzhambu send us your comments below and share the recipe for your friends and family.